Bulgogi, the Korean classic, calls for slices of rich beef; this version uses thinly sliced chicken breast, which has barely any fat at all. 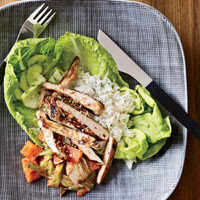 The chicken is best served with rice and lettuce leaves for wrapping. Kimchi, a spicy, garlicky Korean pickle often made with cabbage, is especially delicious on the side, and is loaded with beneficial bacteria known as probiotics. In a resealable plastic bag, combine the soy sauce, sesame oil, honey, vinegar, pepper, scallions, garlic, ginger, and 1 tablespoon of the sesame seeds. Add the chicken and turn to coat. Seal the bag and refrigerate for at least 2 hours or for up to 4 hours. Light a grill or preheat a grill pan. Oil the grates. Remove the chicken from the marinade and brush lightly with oil. Grill over moderate heat, turning once, until lightly charred and cooked through, 5 minutes. Sprinkle with the remaining 1 tablespoon of sesame seeds, thinly slice, and serve. This entry was posted on 3:49 PM and is filed under Chicken . You can follow any responses to this entry through the RSS 2.0 feed. You can leave a response, or trackback from your own site.